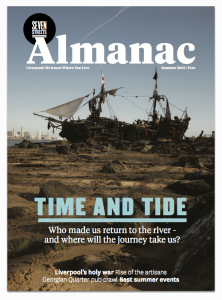 Online Liverpool magazine, SevenStreets is launching a partner print edition, The SevenStreets Almanac. The full-colour, large-format tabloid will feature the best of the online magazine’s content, alongside commissioned illustrations and photography. 10,000 copies will be distributed around the city, with a focus on hotels, coffee shops, bars and independent stores, with the first issue out this week to coincide with the Spring Bank Holiday. The second edition will be published in July ahead of the International Festival of Music and from late summer it will go monthly.